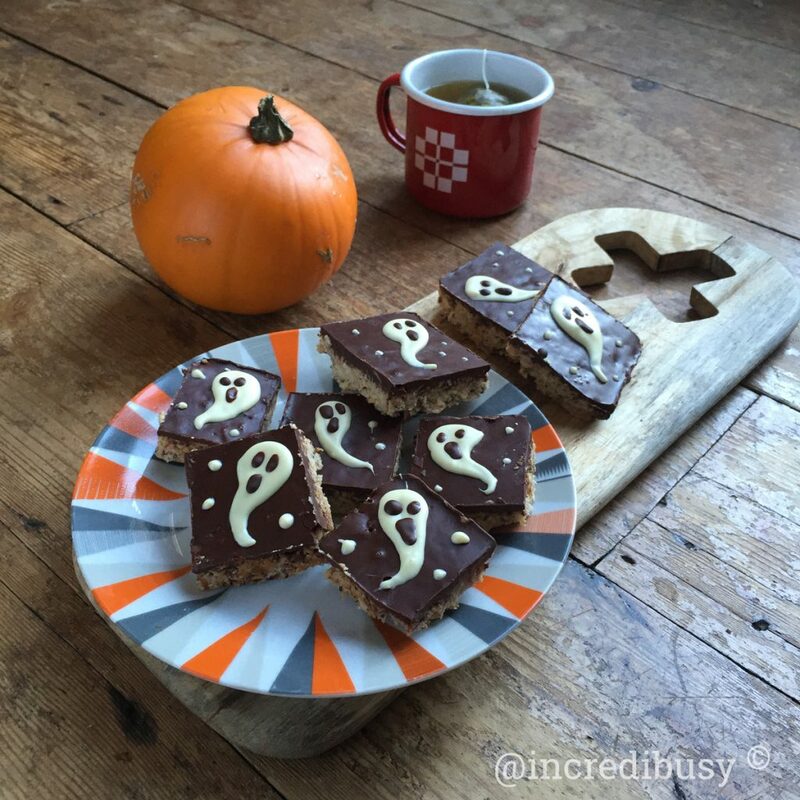 As our kids get older, they are ‘less welcome’ as trick or treaters – let’s face it, five year olds look a whole lot cuter (and less threatening) in a dress-up costume than a teenager! We have decided this year to throw a Halloween Party at home for the teenagers, and put them in charge of answering the door to the little kids who knock on our door, literally every seven minutes! 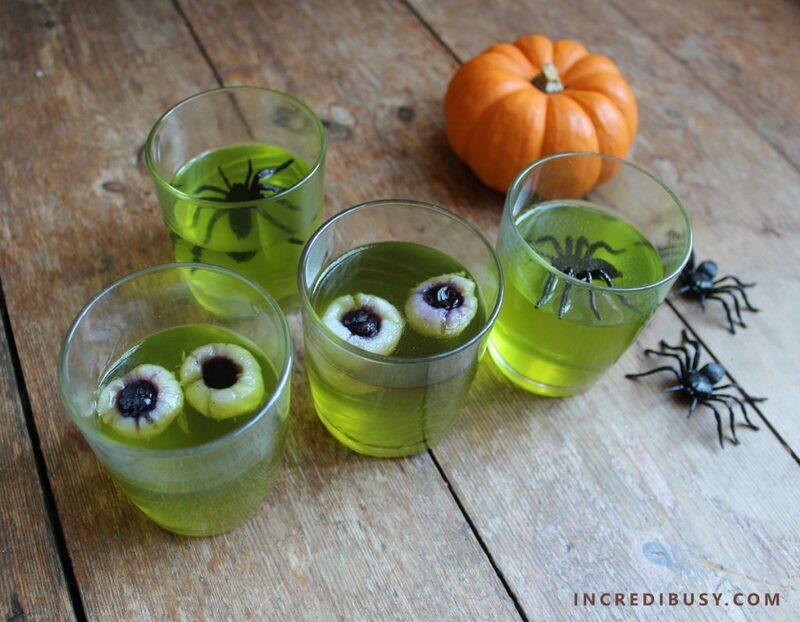 We are going to make these really cool Halloween party food ideas – Jello eyeballs and spiders – Really fun Halloween jellies! Cut the jelly up into cubes because that makes it much easier for it to dissolve. So you pop the jelly cubes into a glass – boil the kettle, (yes we have kettles in the UK – what do you use?!) Fill up a glass jar with half a pint of boiling water, stir that so that it melts. When that’s melted and fully dissolved this is when we pop in our fun bits and pieces! Another idea is the ‘eyeballs’ – these are edible, and guess what? They are tinned Lychee! We added frozen blueberries to the centre of the Lychee as these make really great pupils in the eyeballs. Place your eyeball in the bottom of the glass bowl, and gently pour the jelly over the spiders, and the same, with the Lychee. 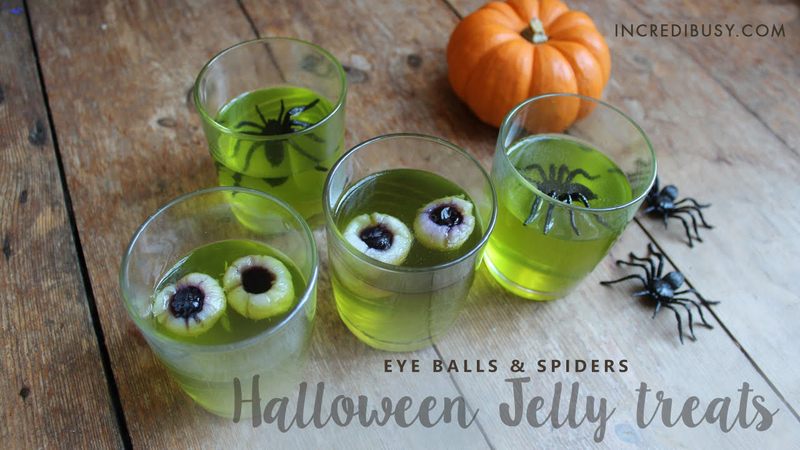 If the ‘eyeballs’ flip over when you pour over the jello, we’d recommend using a toothpick to just move the eyeballs back into position. 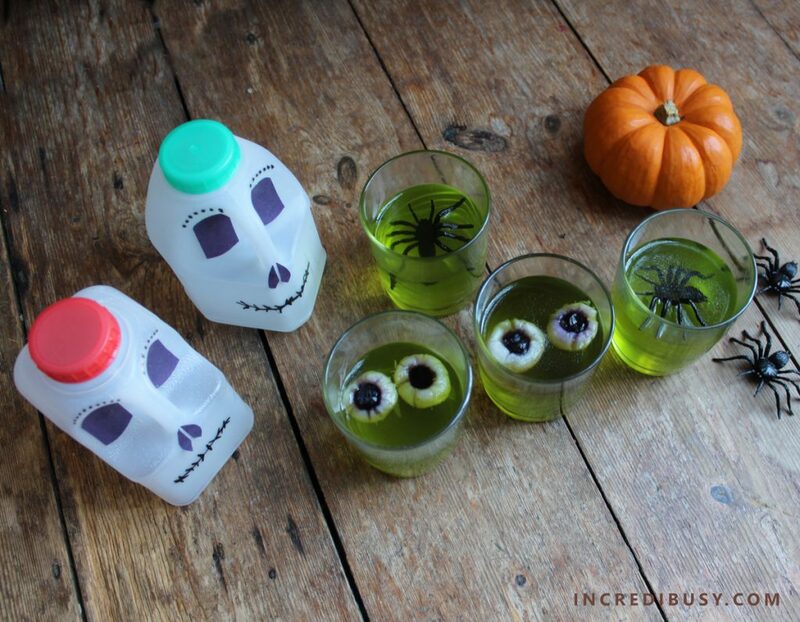 Put these in the fridge to set – and really enjoy the kids’ faces when they see those blood-shot eyes bobbing about in the green jelly! 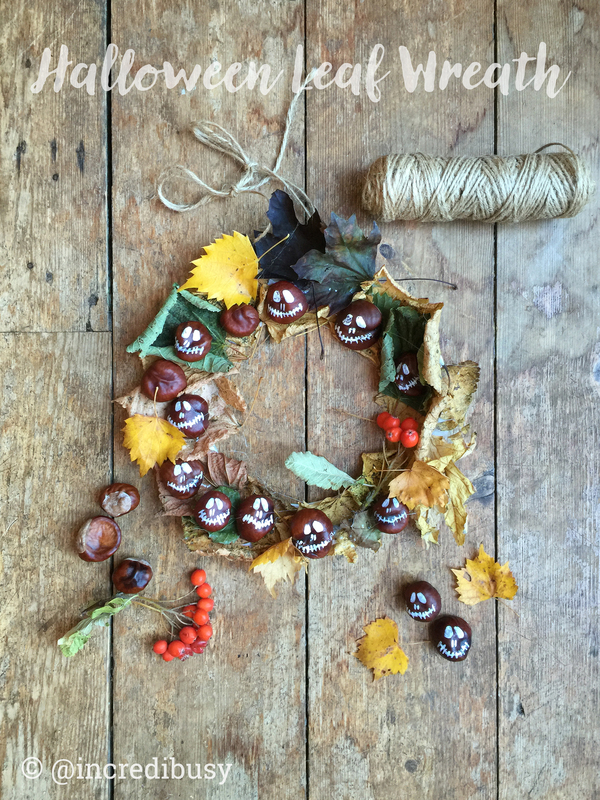 Other Halloween ideas – how about this Leaf Wreath – ghoulishly fun! 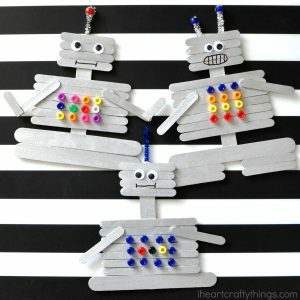 The cutest crafts can often be made from household bits and pieces – and pegs, dolly pegs, clothes pegs, clothespin – what do you call them? 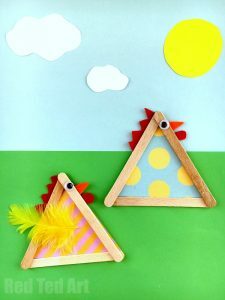 We have a big bag full of wooden pegs, having ditched the nasty broken plastic versions – and they are RIPE for crafting! Now, these were really quick to make, as we used our trusty glue-gun, so super-speedy, so if you’d like to get MORE from this craft, get painting, and adding some stickers maybe?… let’s see your Spitfires! 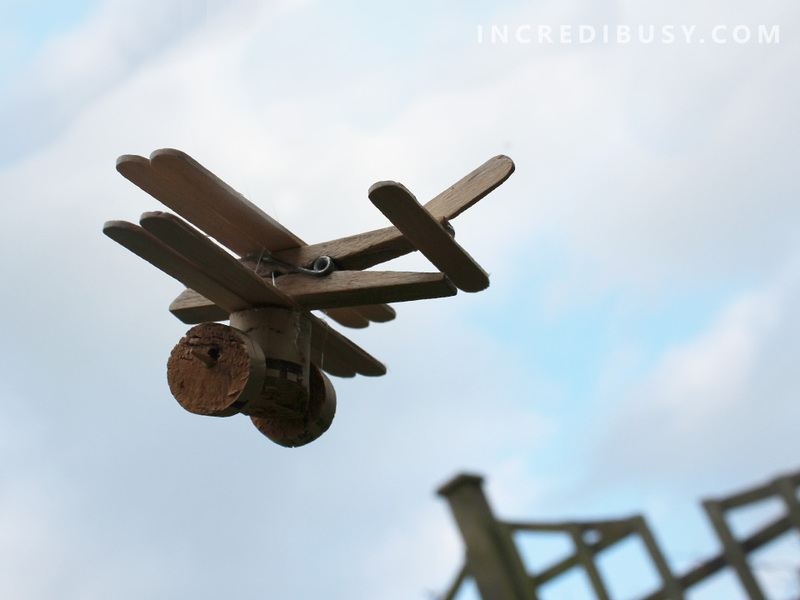 We had quite a lot of fun trying to photograph the peg planes flying high, in the sky…! 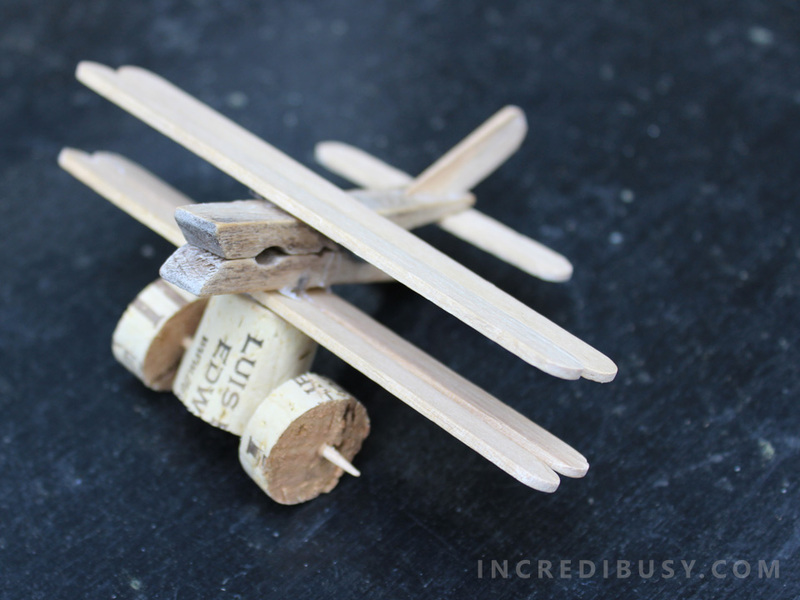 Child said that the lego wheels were ‘cheating’ so we tried a normal clothes peg and sliced a cork into three, creating wheels, using a tooth pick – very satisfying! Maggy from Red Ted Art who showed us four crafts including her Lollipop traffic light biscuits which are featured in her book. 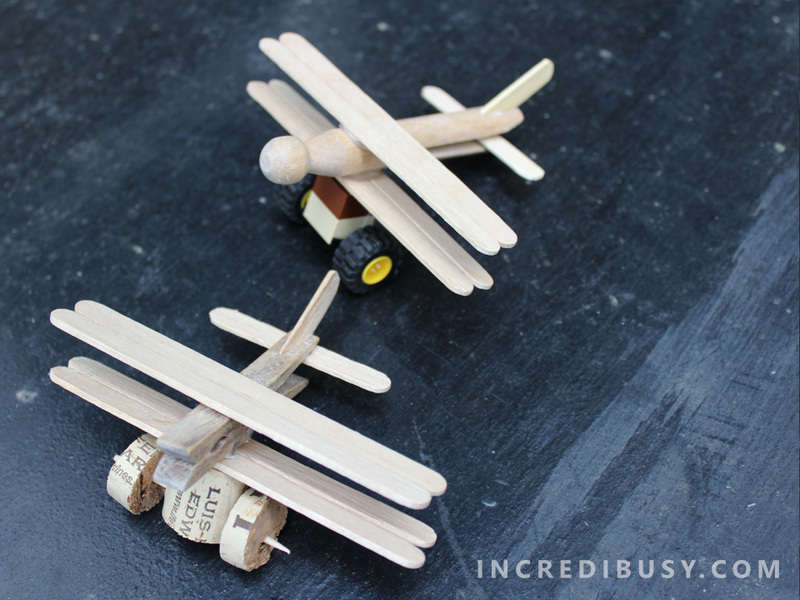 Another great lolly stick craft here from Craftulate – popsicle sticks and magnets! And check out Missie Lizzie Liz‘s lolly stick boats. You know when you accidentally stumble across someone’s artwork and you feel absolutely inspired and excited?? 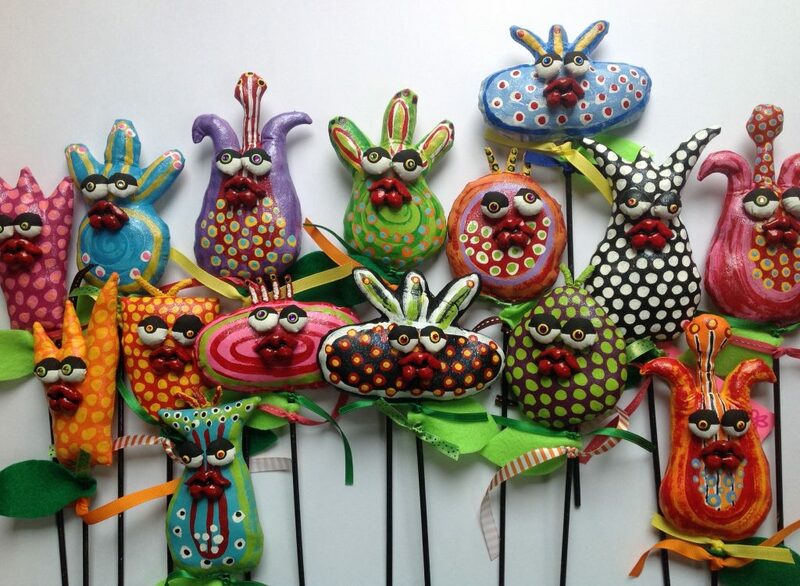 I felt like that when I met artist Jodie Flowers – Jodie lives in New Orleans, Louisiana – and upcycles old sheets and hoarded and collected plastic bags into some of the most unique and creative soft sculpture designs imaginable. It’s amazing to see Jodie’s work in progress and so refreshing to see what she can do with materials destined for landfill – we do like a zero waste craft it has to be said. 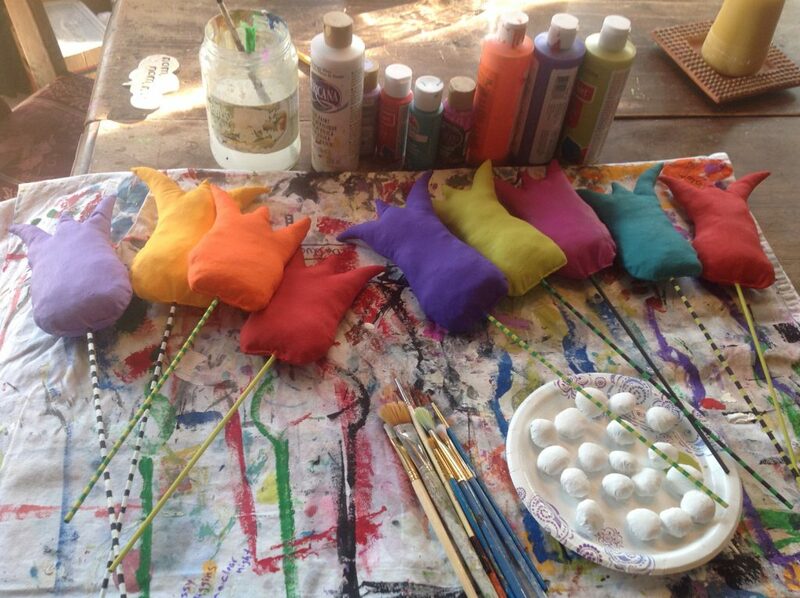 The flowers pictured here, which she lovingly makes by hand – are stuffed with up to eight plastic bags each. Now – here in the UK we are about to have a General Election, and in a nutshell, without being TOO political in what started out as an article about upcycling, crafting, and artistic talent… We are lucky enough to have the NHS here in the UK – the National Health Service – and if you live here in the UK, and need a double hip replacement, as a very young Jodie Flowers does over in the USA – you may have to wait a little while, but eventually, you will be able to see a surgeon here in the UK, and have the support of amazing doctors, nurses and support staff – and all of that is a service which is provided free of charge, the patient is not means-tested – we pay indirectly for this service through our taxes – it’s a system that works (could be better with more financial support from the government, or increasing our taxes, but hang on, I’m coming to that…). In the USA where Jodie lives, financial assistance for medical treatment is means-tested – and if patients are not accepted to receive Medicaid – the patient has to find a way to pay for her treatment herself, – and has no options for financial support – without going into too much detail, I can sense the panic in Jodie’s social media posts – and I hope she doesn’t mind me saying this, go buy her work! 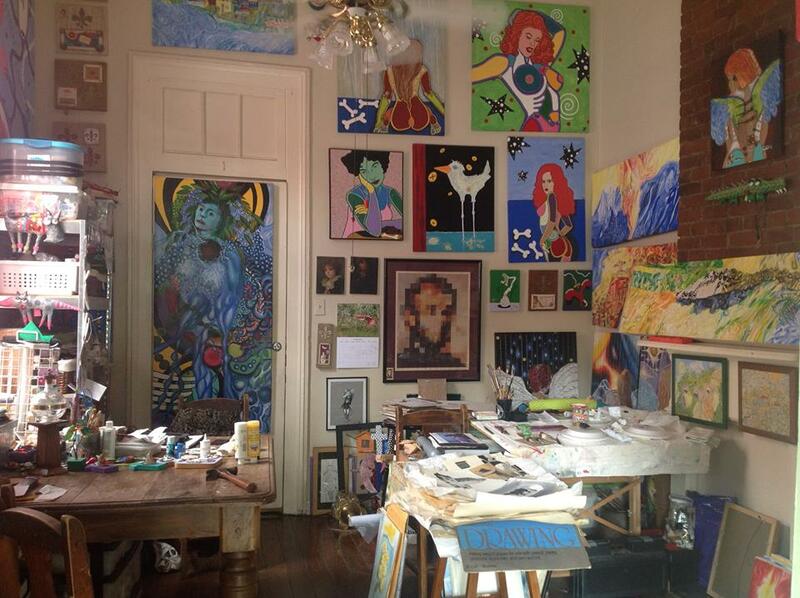 We need to support fellow artists who find themselves unexpectedly in financial difficulty! Enough of that – back to upcycled alligators – wouldn’t this be an adorable decoration for a kid’s bedroom wall? 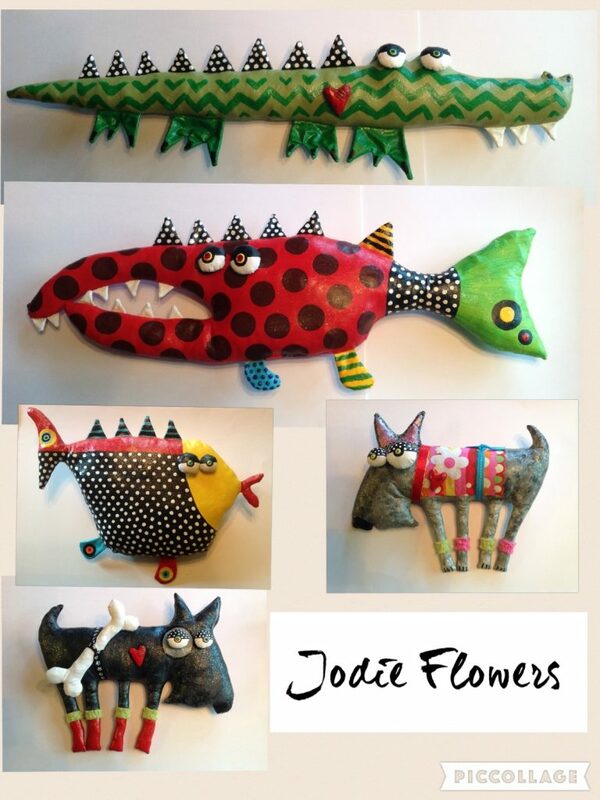 Some of Jodie’s larger creations like the alligators and dogs, are stuffed with up to 75 plastic carrier bags. 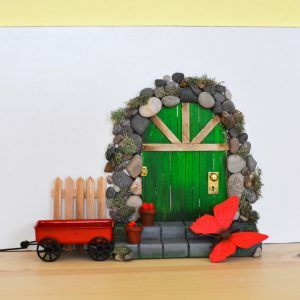 These works of are are all made from upcycled sheet and tablecloths found at Goodwill charity or thrift stores, sewn into fun designs, stuffed with plastic bags, gessoed, handpainted and embellished with crystals and ribbons. 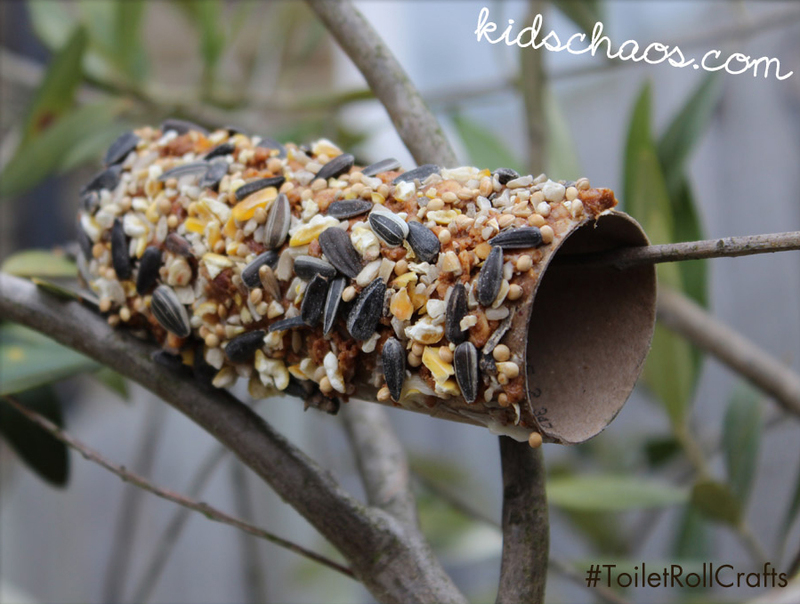 useful things to make with toilet roll tubes – zero waste! Well, I guess you know by now that I’m a bit of a closet zero-waster – and one thing we LOVE in this house, is making stuff, from household ‘waste’ – so we SAVE all of our toilet roll tubes – we do – we do! 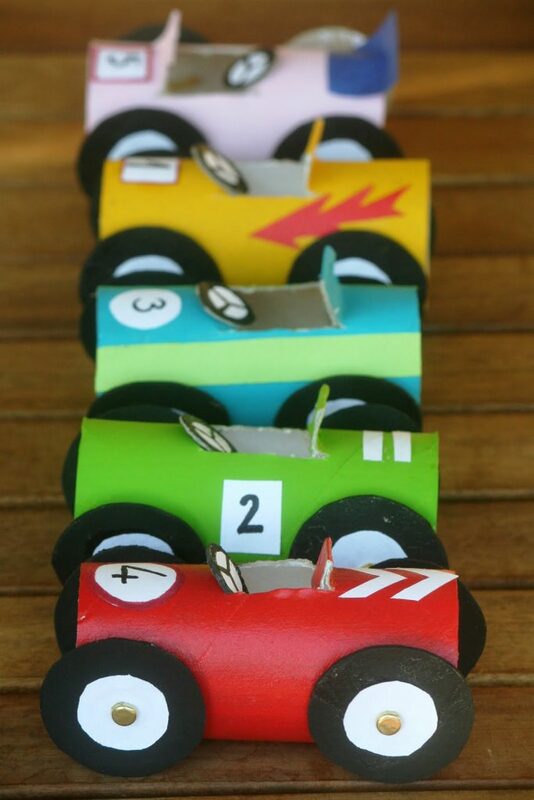 Today we’ve pulled together a selection of really useful crafts, made from toilet roll cardboard tubes – let’s go! 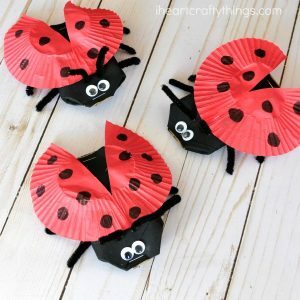 Total inspiration to get things started from Moms and Crafters – what a cute idea! 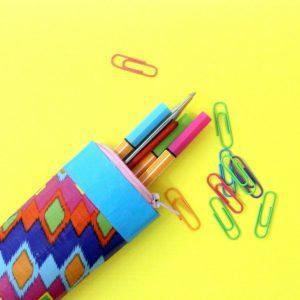 A pencil pouch, or pencil case – with a zipper too! cool…. Flowers!! 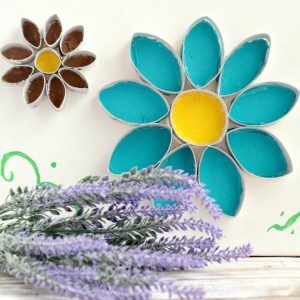 The shape of the toilet paper tube totally lends itself to the flowers of a petal, just look at Family Food and Faith‘s designs for wall art! 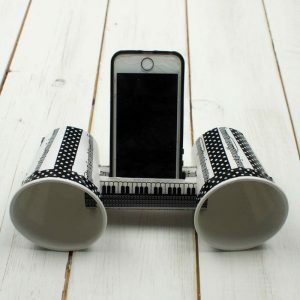 If you want to see something totally inspired – check out this iPhone amplifier made from toilet roll tubes by Mum in the Madhouse! 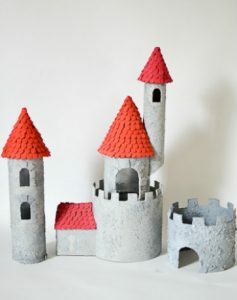 Another great upcycle – toilet roll tubes, and Pringle tubes – and I say this, as I’ve been reading about how just UN recyclable Pringle tubes are – is this wonderful CASTLE by Adventure in a Box. Closely followed by butterflies – awwww…. 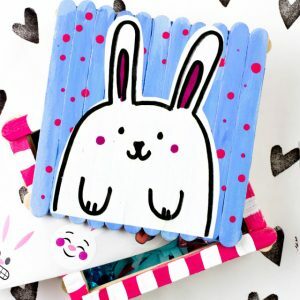 Lovely for your own Messy Little Monster – get those hands in some paint! 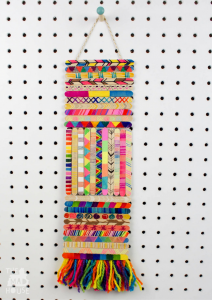 And then, last but not least – our own craft to make a craft – toilet roll tubes, into French knitting looms… too much fun! If you love these – do click PIN IT! 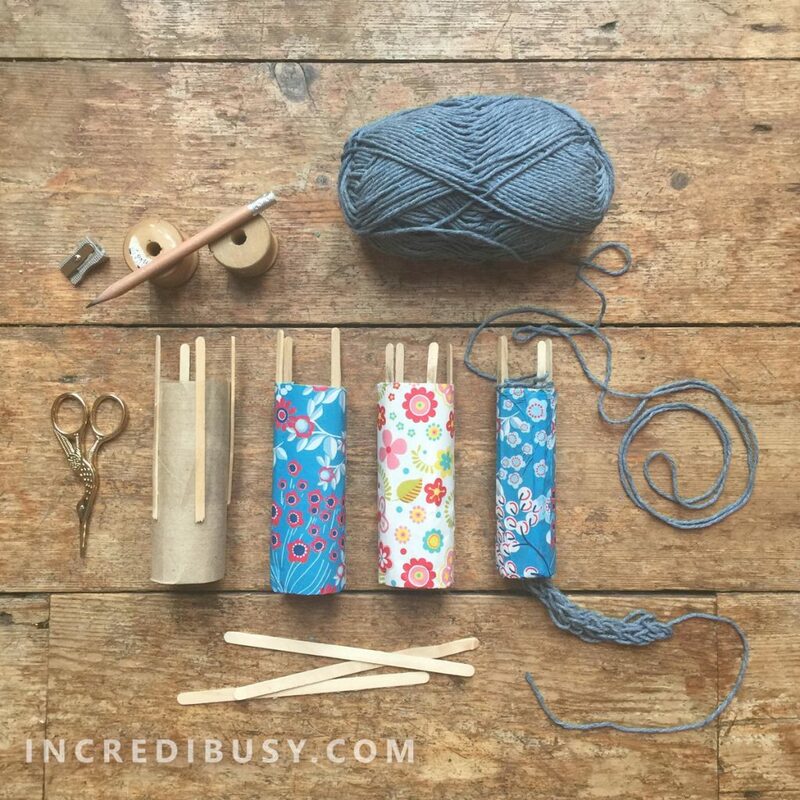 How to make a toilet paper roll french knitting tutorial – A really great craft activity idea – and who doesn’t like a recycled craft for kids and grownups alike? How about making your own ‘knitting nancy’ or French Knitting loom. 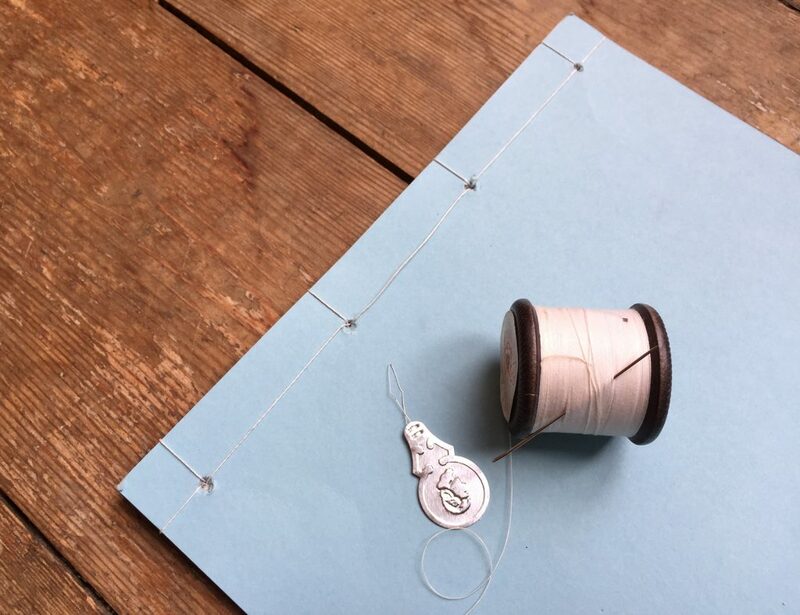 When we were little, my Grandpop made us our own little looms from wooden cotton reels – tacking four little pin nails into the top of the cotton reel, and we’d spend hours making long ‘woolly worms’ of French Knitting – it’s really rather fun! In many countries around the world celebrates on May 17th the International Day for Recycling. Apparently Americans use over 17 billion toilet paper tubes each year. Woah!! 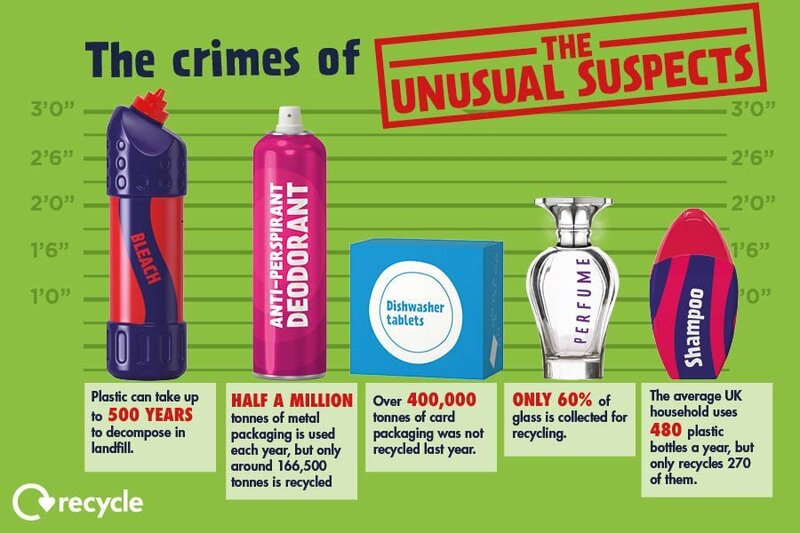 So that’s a LOT of recycling/re-purposing possibilities. 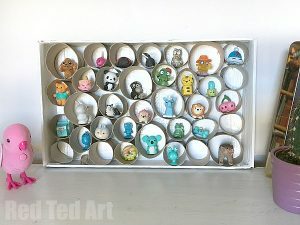 It’s all about Reduce, Reuse and Recycle and where better to start than with the free craft resource, the humble toilet paper roll – a cardboard tube just desperate to avoid landfill, so we’ve been looking at a few ‘repurpose ideas!’ and wanted to try and make our own ‘French Knitting Loom’! cut two coffee stirrers in half – sticky tape the four shorter sticks to the toilet roll tube so that a section protrudes by 1-2cm above the edge, so – if you don’t have coffee stirrers, you can use craft sticks. decorate by covering with a patterned paper – optional – it just looks pretty! And that’s it – you’re ready to start ‘knitting’! This video below shows you how to french knit with your own homemade knitting nancy. So the theme is ‘Artful’ – and I know that a LOT of you will be up for joining in, as the brief is as flexible as you want to make it… Share your creative endeavours, what have you been up? 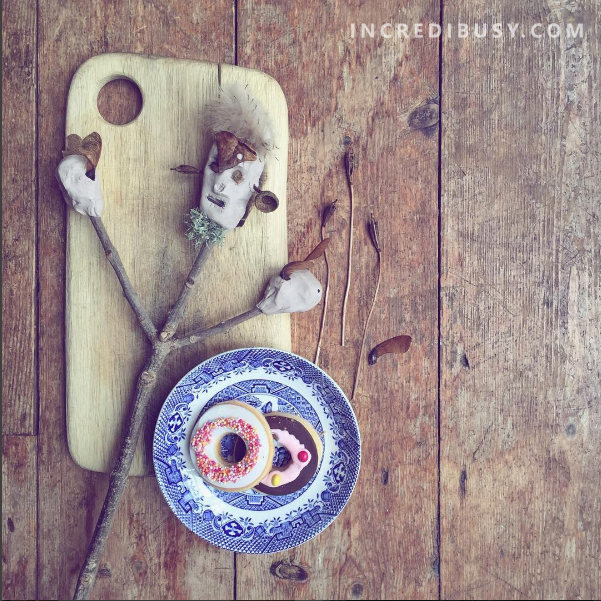 Making, baking, creating, crafting, painting, artfully photographing those little stories of your life, or indeed, be inspired by @MariaRivans (Violet, pictured) and collage! Tag your photos #sgiew_ARTFUL over the next couple of weeks, and our guest judge Saro, owner of contemporary art gallery ‘Eye Like’, will be selecting her favourite nine to appear on the grid… and ONE SPECIAL WINNER will receive a VIP invitation to Maria Rivans Private View on the 24th May, where you can meet Maria, oh AND, win £100 to spend at the gallery or the www.eyelikeart.com online store. More about ‘VIOLET’ (pictured) Saro’s extra special collaboration with collage artist Maria Rivans. 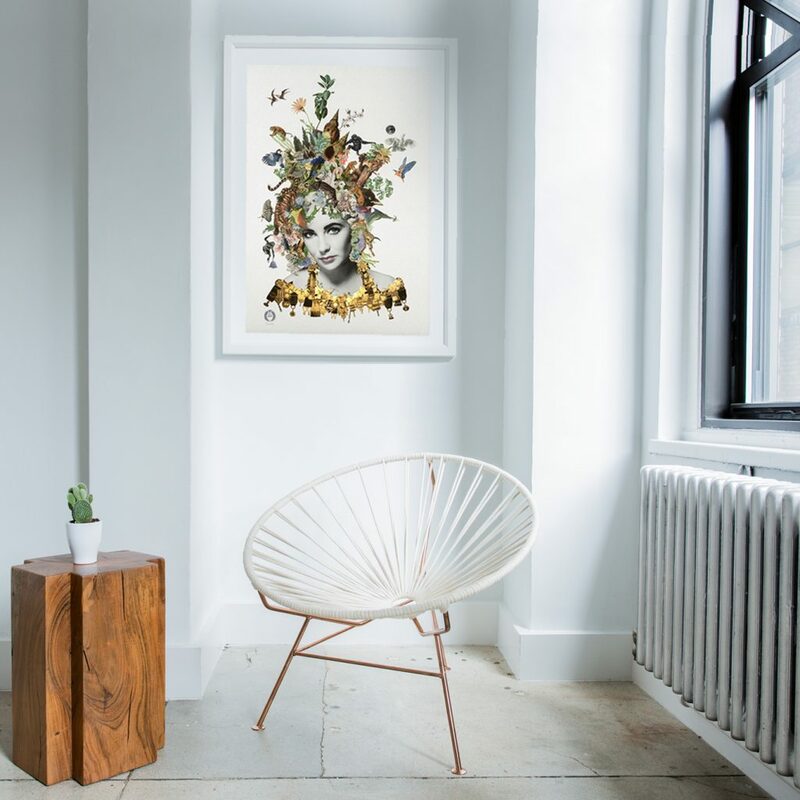 We were starstruck by this unique limited edition ‘Violet’ print – exclusive to Eye Like Gallery, Limited to only 25 editions and each with hand-finished gold foiling! The first 9 editions of Maria Rivans’ Violet are hand-finished, so as well as the stunning gold foiling, each of the nine have a unique hand applied collaged ‘planet’, each one starring a truly eye-catching hand-finished planet. Whether you’d like ‘Venus’ to set a heart on fire, or ‘Neptune’ to fulfil your dreams and desires, you can ensure you own an artwork that’s truly out of this world! 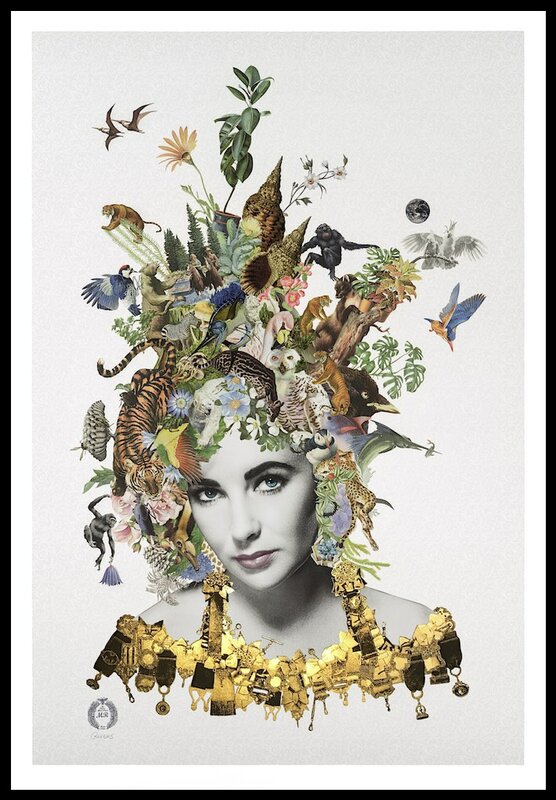 Bonus points if you spotted the iconic beauty of Elizabeth Taylor amongst Maria Rivans’ beautiful collage-y embellishments. An artistic icon herself, Brighton based Maria exhibits her work across the UK as well as internationally. Most recently she had a solo show at the Saatchi Gallery, London. Maria has a reputation for dynamic collages that combine materials from 20th and 21st Century popular culture. 4) CLOSING DATE Sunday 21 May, winner announced Monday 22nd May. 5) This competition does not cover transport to the event. We have a winner! Saro at @eyelikegallery has had a tough time selecting just NINE from the hundreds of entries for the #sgiew_artful hashtag – so without further ado, congratulations to the nine featured here – and a special congratulations to the overall WINNER @emmy_c with her photograph taken in Dublin. 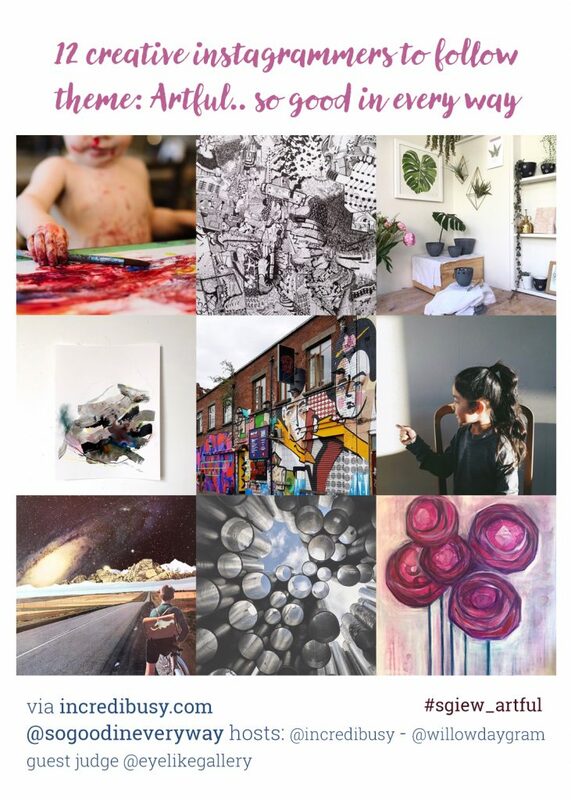 Emmy wins a VIP invitation to Maria Rivans Private View on the 24th May, and £100 to spend at the gallery or the www.eyelikeart.com online store. 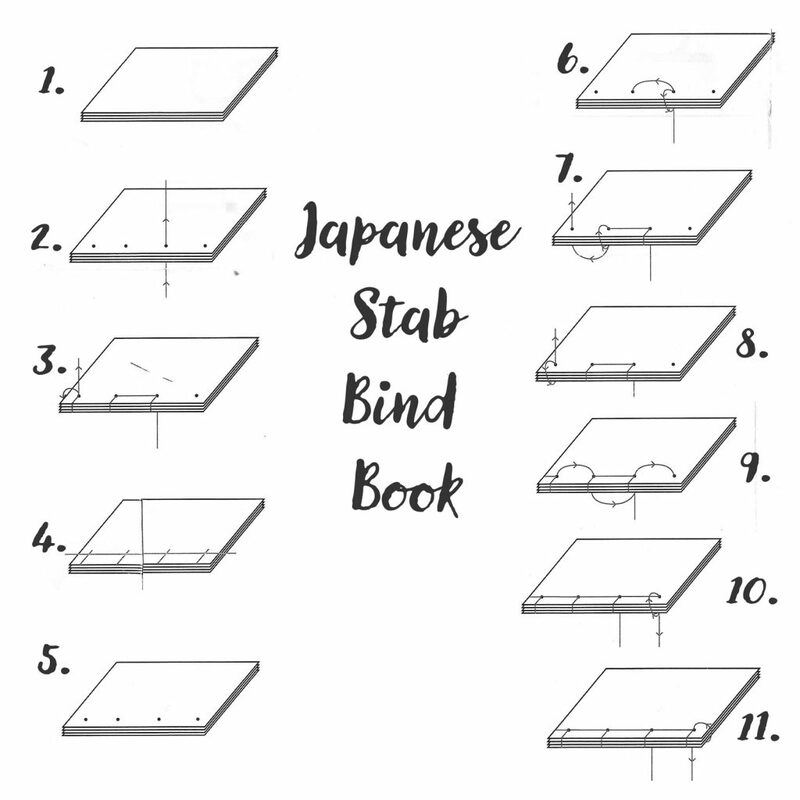 Book Binding – A fun way to make something NEW, the old fashioned way! How to make a book – two great book binding ideas – saddle stitch and Japanese Stab bookbinding – There are lots of different ways to make books – with or without a needle and thread, but this week the kids wanted to have a go at making these ‘notebooks’ using some old cardboard we’ve had for a while. 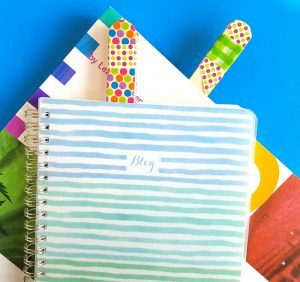 And we ALWAYS have reams of paper, A4 copier paper – the kids really love to draw and write and this is a really nice way of combining an ancient craft of book binding, with their own creativity within. The oldest child is still mad keen on drawing, whilst 12yo is allegedly writing a book – so hopefully he’ll give up writing in his ‘notes’ on his iPhone, and revert back to good old pen and paper when we’ve finished making these books! For this book, you need four to six single sheets of paper, and one single sheet of card for the cover. Fold all of the paper in half, so if it’s an A4 sheet, fold down to make A5. Take your first sheet, and mark approximately in the middle of the sheet, on the fold, and then two marks on either side of the centre – equal distance from the centre. Push your bodkin (or sharp pencil) through these three holes. Use this sheet as a template, lay on top of the next sheet, and push through the holes so that all of your sheets have three holes, in the same place. 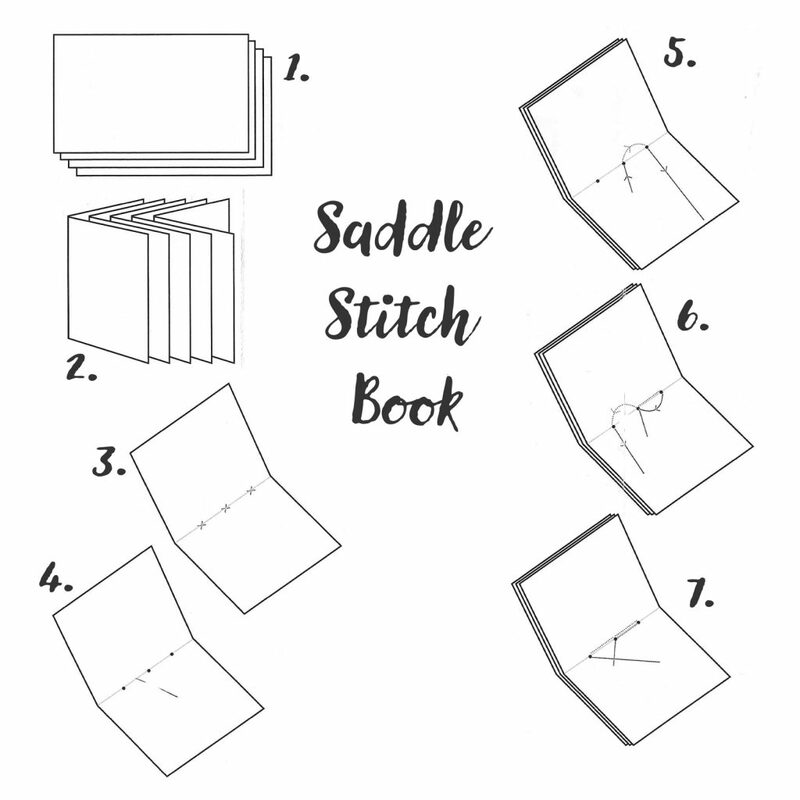 Stitch by pushing your needle through the centre hole, to the back of the book, and back through the top hole, then through the centre hole and back through the lower hole, to the back of the book again. Tie of tightly and you’re finished! For this book, you need six to eight single sheets of paper, and two single sheets of card for the covers. Using bodkin (or again, a sharp pencil) push holes through the four points. Take care when you line up your ‘pages’ – again use that top page as a template for the other pages. 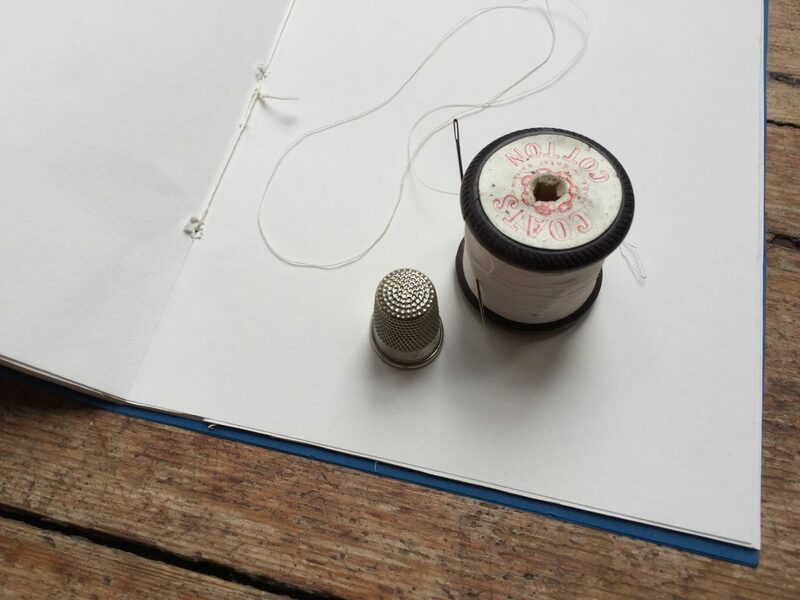 Hold the book securely as you thread your needle up through from the bottom, up through one of the centre holes. Hold on to the end of the thread. Sew around the spine, and back through the same hole again from the bottom, out and down through the other centre hole. Pull the thread tight. Around the spine again, down through the upper middle hole, and up through the top hole. Pull the thread tight. Around the top of the spine and up through the top hole again. Pull the thread tight. Keep going, DOWN through the upper middle hole, back UP the next hole and down through the bottom hole. Pull the thread tight. Then around the bottom of the spine and back through the bottom hole. Pull tight. So, if you are looking for more fun ideas to make and create, you may like to have a look at our air drying clay puppets that we made recently! 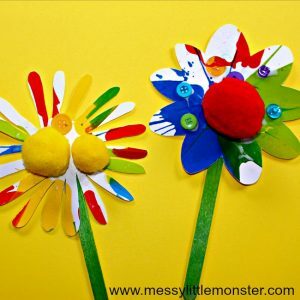 You know we like to save our lolly sticks, coffee stirrers, and wooden spoons from our day trips – so we thought you might like some fun upcycling ideas – we’ve some fun kids crafts to enjoy – whether with your own kids, or with your school class, we hope that you enjoy this resource – and check out the blogs listed – all of them have FAB ideas for crafts with kids, and lots of them really focus on upcycling and recycling – we love the junk box! 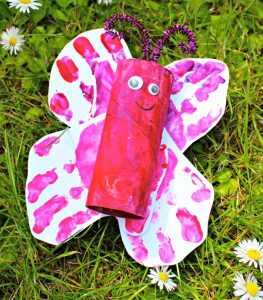 It’s all about the puppet – and these Air Drying Clay Craft Stick Puppets are a brilliant rainy day project – you may have seen our Woodland stick puppets – well these are the indoor version when the weather is just too wet and rainy to get out! 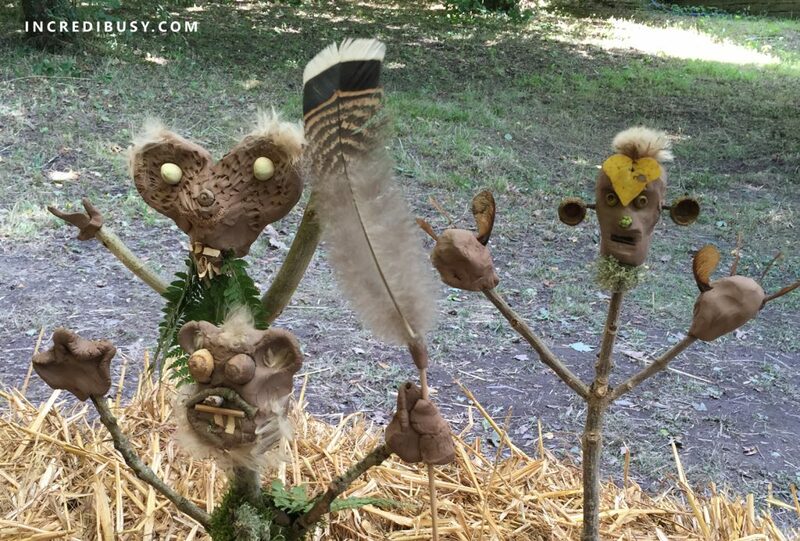 We LOVED making our woodland stick puppets, yet leaving them out in the garden (in the rain) has taken their toll… the clay we used went a bit soggy, and they have gone back to the big puppet show in the sky! 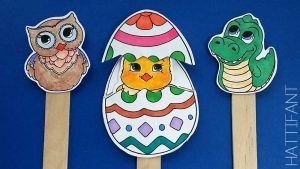 Sooooo we thought we’d have a go at making some Craft Stick Clay Puppets with a bit of domestic foraging, well, craft box foraging – and these are a little bit more colourful! We have so many buttons in our button box, inherited from my Mother and both of my GRANDmothers – and lots of leftover bits of wool and embroidery thread so we thought this could be a fun (indoor) version of the Woodland Stick Puppets! We had a few leftover shop-bought googly-eyes, and craft sticks, and some, (coughs) coffee stirrers ‘acquired’ from the local coffee shop and of course – Air Drying Clay. Pull a large marble sized lump of air drying clay from the packet, being sure to seal it up completely once you’ve done so – this stuff dried out QUICKLY. Roll the lump of clay into a ball, and start forming the character’s features – pinch out a nose shape, use a coffee stirrer to push in some eye sockets. Use your finger to push under the nose to create a mouth – make it a smiley face! and smooth out any cracks with a small amount of water on the tip of your finger – Add googly eyes if you like, or leave as is – these clay faces are pretty characterful even without the addition of googly eyes! Add teeth too if you fancy – again we used the end of the coffee stirrer to create this look. Push the clay head onto the end of the craft stick and start assembling the decorations! 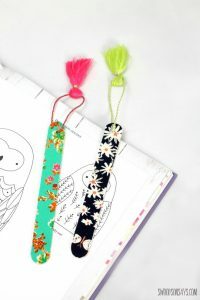 We glued buttons to the ‘chest’ of the stick and tied a little bow around the neck, and added fun feathers and fluffy wool for hair – add whatever you have around the house or in the craft box – and have fun! 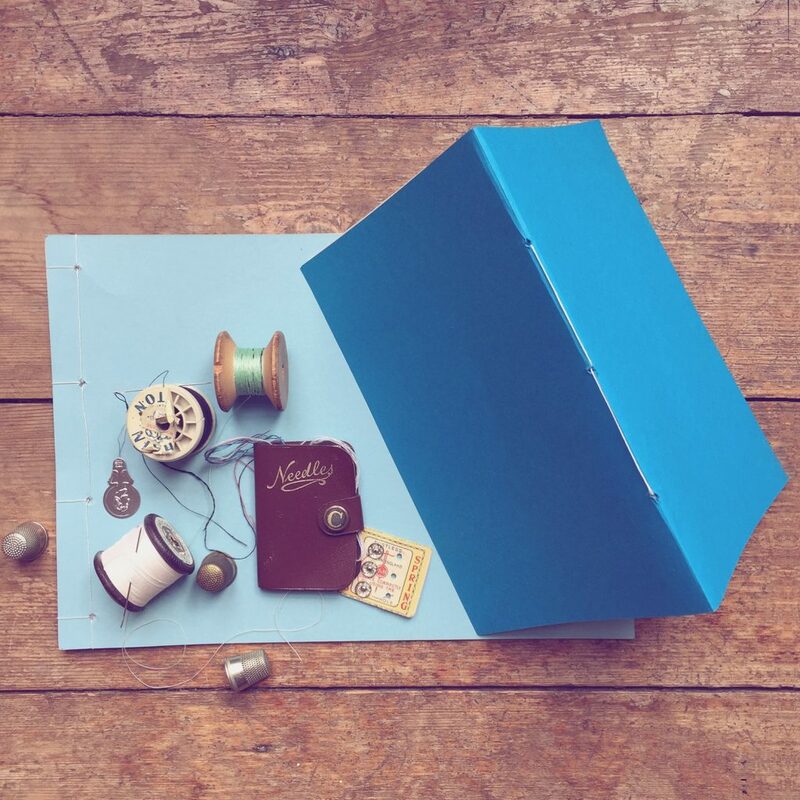 And you know me – I like a craft that just keeps giving – we’ll be making a little video of the puppet show, maybe even a stop motion animation, so we’ll be sure to share that with you too. 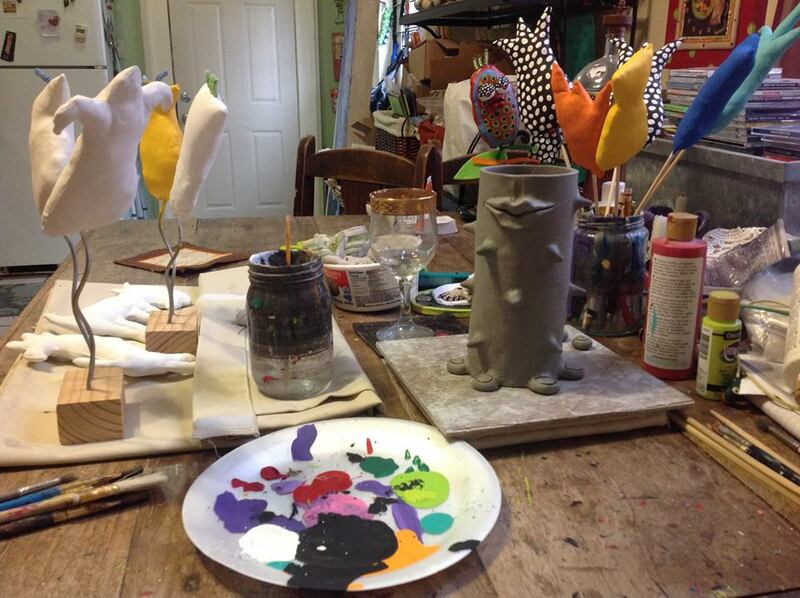 If you enjoyed this Air Drying Clay Puppets post, do share and Pin the photos too! And the brief for that ‘adventure’? Sticks that would look a bit like a BODY – so a three pronged stick – (think, neck, head and two arms). 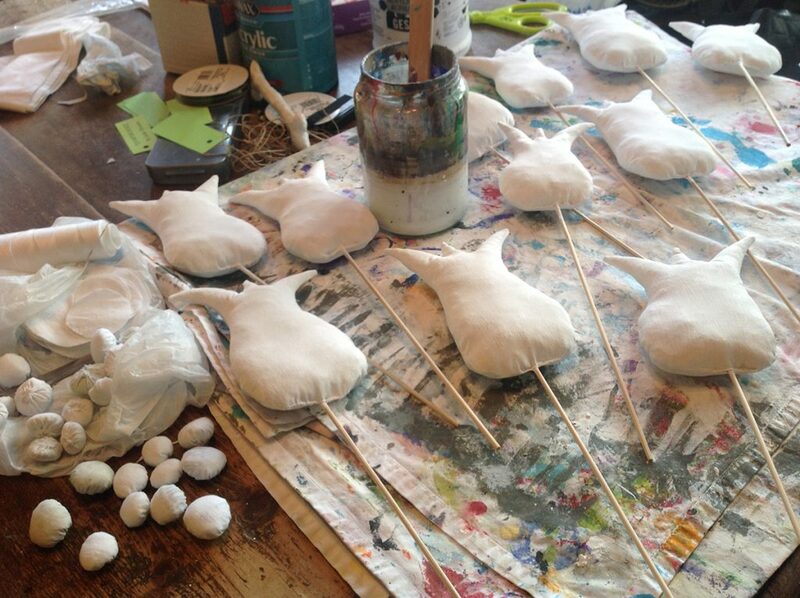 And then as many of nature’s accessories as you can carry for your woodland puppet creation! Dried seed pods; feathers, acorn cups, leaves, seeds – and moss too – the more you collect, the more options you have to be creative. So it’s pretty simple really – see the photos for reference and inspiration. Position your sticks – you may need to break the arms down to the right length, that sounds bad right?! And then select your puppets eyes, ears, and fingers as the basics. Grab three small lumps of the air drying clay, and roll them into balls, one large and two medium for the hands. Gently push the balls of clay onto the ends of the three pronged sticks, squeeze the clay so that it’s tight on the sticks. Then you’ll need to act swiftly, as – guess what, the air drying clay, dries in the air! 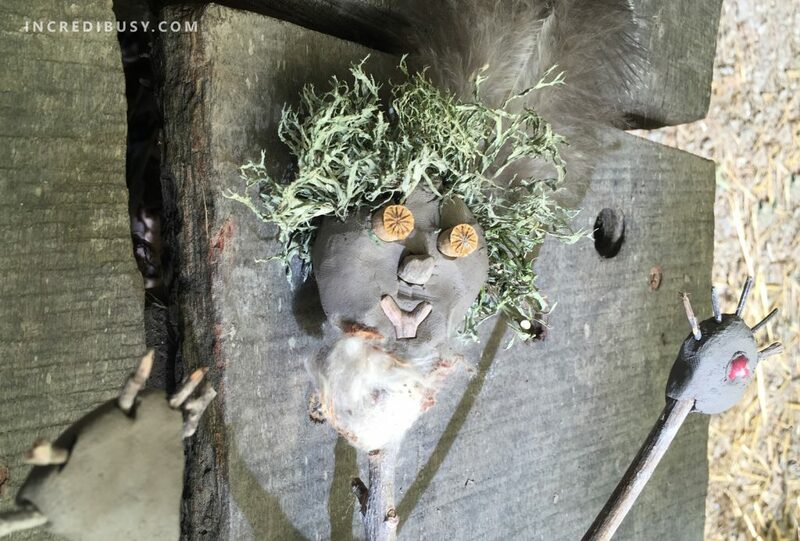 Shape the head and add texture, or leave just as a lump – and then…..
Start assembling and creating your puppets – this is so much fun – honestly, just use your imagination, build the puppet’s faces up, and add a leafy scarf and some crazy moss hair! More woodland creations from Tamsin Young – pencils!